Start winning on Adwords with our management services. When done right, AdWords is an amazing source of new business. It’s also extremely measurable, which among other things means return-on-investment can be closely monitored. Compared to most forms of advertising, AdWords is as close to a guarantee as you will find. With AdWords Search Campaigns, your ad will only show when a prospective customer is looking for your services, and only pay when they click. We often recommend to our clients that AdWords should be their starting point before investing in other forms of marketing (like SEO) because it brings quick results even if you don’t have an established web presence. If you were a local plumber, we would set up a campaign targeting your service area. 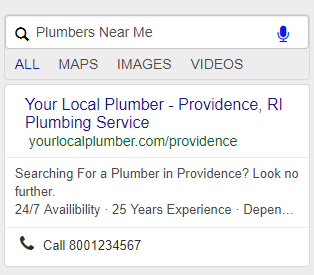 When someone in this area searches for ‘plumbers near me’ , your ad will show. We would also set up a click to call button so prospective customers are only a click away from booking an appointment. While the mechanics of how the ads display is simple, there is a lot going on behind the scenes. Testing which ads are most effective by experiments with various ad copy. Dialing in on which keywords are most valuable to your business. Driving down cost-per-click and lowering the overall costs of advertising. Optimizing for conversions, ensuring that every click has the best chance to become a customer. Analyzing how visitors use the site, and adjusting accordingly. We Do Stellar Keyword Research. As mentioned in our SEO Page, our keyword research is top-notch. In a PPC campaign, the keyword research stage is extremely important and we don’t take this step lightly. It provides us with insights on how your customers search, the demand, and gives us an idea of how your account will be structured. No AdWords Campaign is beyond improvement, and every account needs constant tending to become the best it can be. We consistently look for ways to lower costs, boost performance, and improve your conversion rate to get the most out of every dollar you spend. When things are going great, we dig into analytics and see how we can duplicate the results and scale it up. If something isn’t working, we’ll get to the bottom of why and adjust accordingly. You can rest assured that data is the driving force behind all decisions, and we’re an open book.